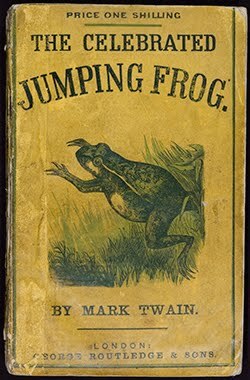 Dialect and "The Celebrated Jumping Frog of Calaveras County"
Twain's use of dialect in "The Celebrated Jumping Frog" reflects the individualism of areas all over the United States. Dialects across the country deviated from the norms of standard English in the use of pronunciation, vocabulary, and how words were used. Simon Wheeler tells an American Frontier tall-tale in a very American frontier, far West dialect. The story is framed in standard English. This contrast between the two dialects creates two very distinct character profiles. Without much description, the dialects of the tall-tale teller and the listener create two very distinct individuals.